Hours: 9:30am-6:00pm, Monday-Friday and 10:00am-4:00pm Saturdays. Appointments work best for consultations, and are required for installations. We are a small crew, and we’re usually working on cars, so email is often better than the phone (please include make, model, and year of vehicle, thanks). Please give us 48 hours to reply – most of our e-mail replies are like War and Peace (i.e., long and time-consuming to write). We can usually be reached by phone at 503.208.6246. If you get voice mail, we will call back when we can -we are probably with another client. We strongly recommend making an appointment before stopping by. We want to have time for everyone, and if we happen to be on a deadline, that’s harder to do. We also might be out picking up materials, etc. Finally, faxes should be sent to 503.419.4655. 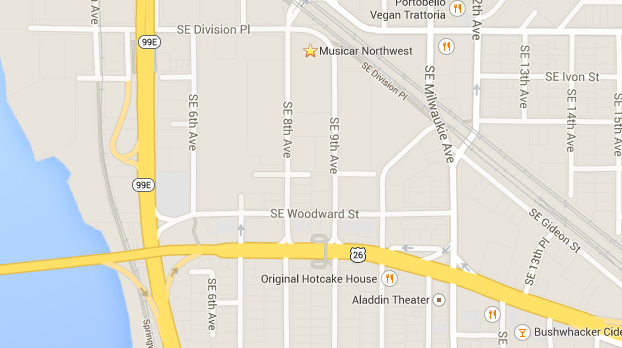 If you are mapping a route to us, we recommend using 2504 SE 8th Avenue. PLEASE NOTE – you must enter the parking lot from the SE 8th Avenue driveway.